Accessories: Accompanied by Vacheron Constantin Certificate of Authenticity confirming production of this model in 1940, original unrestored extra dial and further accompanied by duplicatas of archival documents and sketches. Certain watches have been so relevant, historically important and inspiring that they have come to be referred to by the name of their owners. May they have been royalty: King Farouk (Vacheron Constantin), Marie Antoinette (Breguet), businessmen: Henry Graves Jr. and James Packard (Patek Philippe) or celebrities such as Paul Newman (Rolex) or Elvis Presley (Omega). This elite circle will soon be joined by the present (Vacheron Constantin) "Don Pancho". The World of Vacheron Constantin by Carole Lambelet and Lorette Coen published in 1992 was seminal not only as the first book dedicated to the oldest watch brand in continuous operation, it is also pivotal for its revelation of a horological myth and fantasy. A small black and white photo placed amongst dozens of other on page 404 ignited an amazing frenzy of conversations, questions and debates among collectors and scholars. Pictured in this archival photograph was a tonneau watch dated 1936 with crown at twelve o’clock and featuring a day indication at six o’clock, a retrograde date and displaying a minute repeating trigger placed unusually on the right side of the case and only identified by its archive photo number: 3620. A shroud of mystery surrounded what was most probably one of the most complicated wristwatches ever produced at that time. The name Brooking Madrid was printed on the dial, a retailer that had gone out of business decades before, and no one at Vacheron Constantin had ever seen the watch nor knew about its whereabouts. This watch had turned into a legend that every horological grail collector, scholar and enthusiast wanted to pursue but could not as its very existence was untraceable…. until now. Over 25 years after the publication of The World of Vacheron Constantin, Phillips finally brings this masterpiece to the public as we have been conferred the privilege of offering what is most certainly the most valuable, historically significant and rarest of Vacheron Constantin wristwatches. In the following pages, you will witness some of first and only colour images of this legendary watch ever published. Even more mind boggling is the fact that less than 10 people have even seen the watch in the flesh at the time this catalogue is going to print. In December 1935, Vacheron Constantin received a letter from Madrid-based retailer Brooking who, on behalf of a client, wished to commission a watch in a large two tone tonneau case featuring calendar and moonphase indicators as well as a minute repeater. The dial was to include at least 11 easily legible and radium filled numerals. Ensued a creative ping pong between the patron, Francisco Martinez Llano, a highly successful Spanish businessman – via Brooking – and Vacheron Constantin. The former had a very precise idea of what he wanted: a large yellow gold tonneau case, crown at twelve, minute repeater with the lowest possible notes, repeater trigger on the right side of the case, day, retrograde date, his initials in blue enamel on the caseback, two dials, one with enamelled black Breguet numerals and the other with radium numerals, both with all twelve numerals, and 6 straps which are easily changeable! The creation of this masterpiece was a combined effort among Switzerland’s greatest craftsmen who had worked on some of the most complicated watches to have been produced: the repeating mechanism being assigned to Nicole, the calendar to Victorin Piguet and the dial to Stern Frères. Interestingly, the size of the dial being too small to fit the Arabic numerals in full as well as all calendar functions, the client chose practicality and opted to have the day and date only and to make do without the month indication. For ease of use, Victorin Piguet modified the perpetual calendar module to a simple calendar with semi instantaneous jumping date. The watch was finally delivered in January 1940 – with only one radium dial – to Don Pancho, as Francisco Martinez Llano was affectionately called by his friends. Don Pancho had left his native Spain in the late 19th century for Latin America where he made his fortune in mining in Chile. He was a philanthropist and a benefactor whose self-imposed mission was to bring education to poorer families by funding schools both in Spain (where he received recognition from Alphonso XIII, King of Spain) and Chile. Following his passing away in 1947, the watch remained in a vault for 60 plus years before it was rediscovered by his family. The years spent in the hot and humid climates of Latin America had left their traces on this timepiece. As a result, the original dial showed substantial ageing and the movement needed complete restauration. It is at this point that Vacheron Constantin’s expertise and talented watchmakers re-joined the adventurous journey of this timepiece. The watch was left in the caring hands of its maker with the instruction to restore the movement using as much as possible original components, not to polish the case and to create a second dial, identical to the original one with the techniques used in the 1930s, with the only exception being the use of modern luminous material as opposed to radium. The original unrestored dial is also offered with this watch. For months, a team from the Heritage department worked relentlessly to uncover all archival material available and a team of watchmakers was dedicated to bringing this watch to its former glory and the final result is nothing short of astounding. This timepiece is both a genuine horological prowess where the watchmakers managed to miniaturize such a complex mechanism to be housed in a wristwatch – at a period where complications were still reserved for pocket watches – and a gem of horological design with its large case, taut lines, angular lugs and superbly balanced dial, and the large Arabic numerals further enhancing the dial’s unbeatable panache and dynamism. The historical importance of the present timepiece cannot be emphasized sufficiently. Made during an era where multi-complicated wristwatches simply did not exist, it was a technical feat and masterpiece of human genius. The combination of a minute repeater and calendar with retrograde date were never seen before in a wristwatch and we had to wait close to 60 years to see anything similar. The present Vacheron Constantin is offered with its original unrestored dial as well as duplicate documents and various sketches from the Vacheron Constantin archives retracing the evolution of the watch from original order to completion. 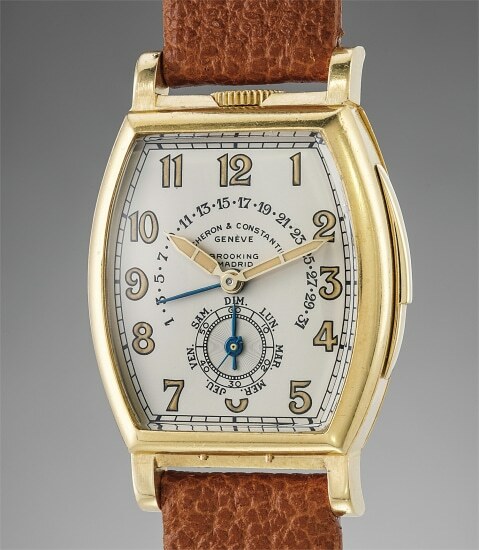 Three wristwatches featuring calendar indications and a minute repeating mechanism made before the end of the 1940s are known today: a Patek Philippe that is today in the Patek Philippe Museum, the James Schultz made circa 1930 that is today in an important private collection, and the present Vacheron Constantin “Don Pancho”. This is therefore the ONLY occasion for the avid collector-scholar to obtain such a rare and historically important timepiece as there will simply be no other future opportunity.